One day, I just got really fed up with Number 1 and his LEGOs that are just everywhere around my home. So I took his bin and told him that I would donate some of the pieces until I stop stepping on them. Of course, no such thing happened. I wimped out. 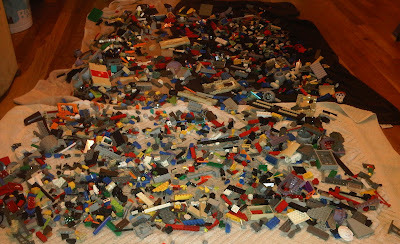 Don't tell my kids this but the only time I'll be giving their LEGOs away is when they have their own children. My future grandkids will surely think that I'm the coolest grandma in the world. I told my son to sell these but he never does Photo by: Toys are Tools courtesy of Number 1. 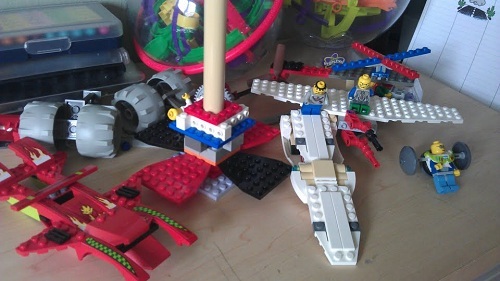 Despite the mess, my son will often make something really cool. His creations show what he likes most about design: symmetry, function, and dreaming. But still, inside me is an unmet need. I must be truthful and say that if I had the patience, I would sell our stash and buy him just plain bricks-- you know... the ones that look like simple 3-D geometric shapes. I love when he makes something with simple bricks of very few colors. It just looks better. 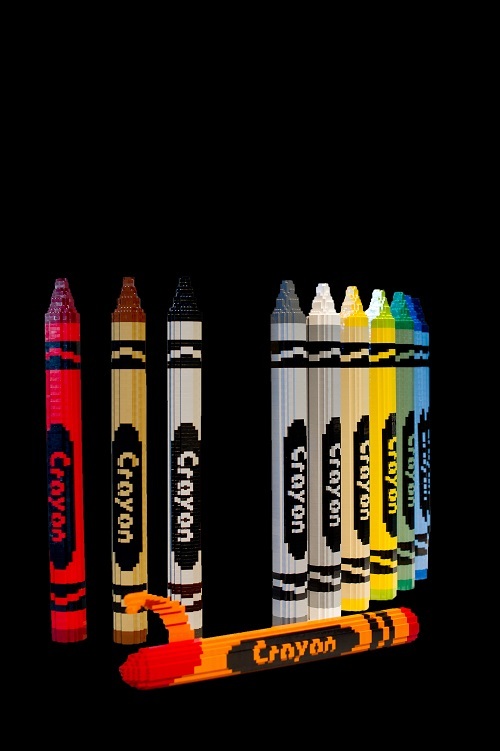 David Wells, Manager of Creative Making and Learning at the New York Hall of Science once taught me that when building blocks are of the same color, you can really see the structure. That made sense to me the moment he said it even though I never once thought of it this way. Additionally I like plain bricks because in them lie the real challenge. 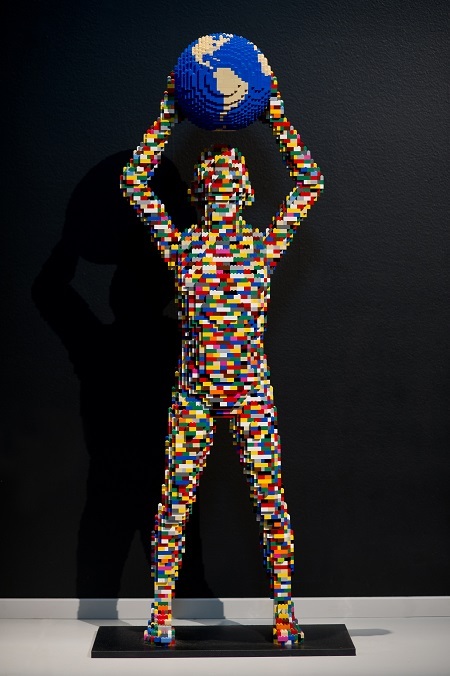 Unlike with stylized bricks the challenge of self-expression is not with fulfilling the want for MORE but rather, it is finding the answer for HOW. That is Problem Solving 101 to me. Some may say "Creativity 101" or "Art 101" or just say, "Make do with what you have," which are the wise words of Petra Pankow, an arts museum educator who teaches at MoMA and the Guggenheim and is now Manager of Tours and Gallery Interpretation at Montclair Art Museum. Because I feel this way, I am asking you to join me in voting for "Small Yellow." 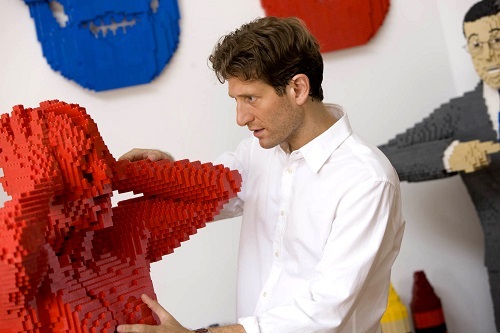 This is a creation designed by Nathan Sawaya. Let's get this amazing kit on store shelves and give our kids a chance to show themselves what they can really do with LEGO bricks. But first, let's hear a little more about the artist. Is this the first time you are venturing in creating a kit for market? A few years ago I created a LEGO Statue of Liberty kit. It was the first time I had ever created a kit for the retail market, and was a very surreal feeling when I walked into a store and saw it on shelves for the first time. With this Small Yellow kit, I am hoping to get that same feeling. 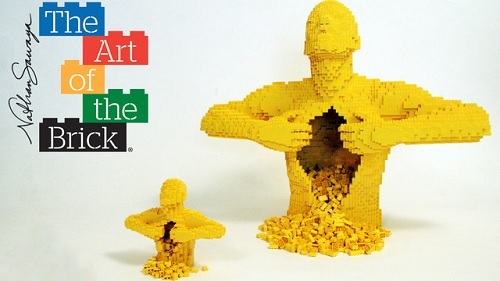 My sculpture Yellow has become a bit of an iconic piece of pop art and it is the centerpiece for my touring exhibition, THE ART OF THE BRICK. When I visit the museums around the world that host the tour and talk to fans, I am constantly asked about Yellow. It seems to resonates with people on many levels. Often I've been asked about selling the sculpture or duplicating it for collectors - but it's currently not for sales. 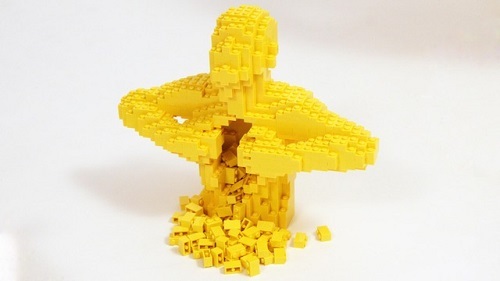 So the LEGO Cuusoo crowdsourcing program was a way to share a smaller version of Yellow with many people at once. 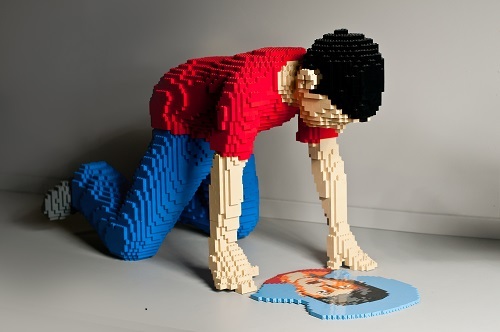 If it gets enough support on LEGO Cuusoo - it will become widely available and then anyone can create their own iconic work of art. Why Small Yellow? Why would you choose (is this the first Sawaya kit by Lego?) a monochromatic kit? A full-scale Yellow would be unwieldy and expensive. I designed the smaller version to still capture the essence and detail of the life-size sculpture while at the same time being more manageable. Who do you see as the buyer of these kits? What age group? adults? kids? what age? 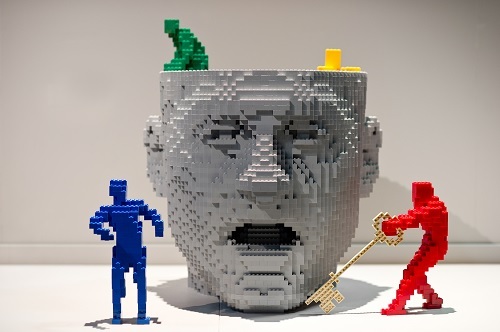 THE ART OF THE BRICK exhibition has been visited by more than a million fans since it launched. 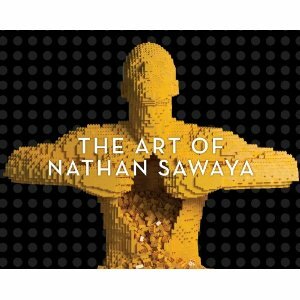 And my new book THE ART OF NATHAN SAWAYA sold-out and went into a second printing in the first few months. Never in my wildest dreams did I think my artwork would resonate with as many people as it has, and with so many diverse groups of people. Kids love the art obviously because of the medium. It is a toy they are familiar with, love and connect to. Their parents and other adults seem to gravitate toward the emotion, whimsy and craftsmanship of the art. 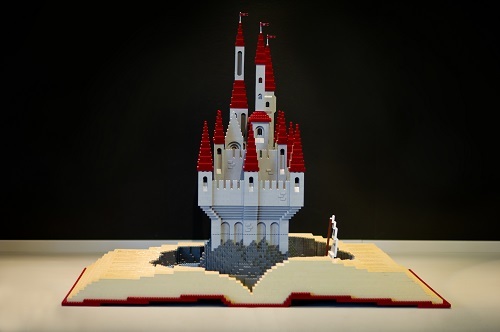 The hope is that if this LEGO Cuusoo project is supported and green lit, then it is available to all types of fans - young and old, boys and girls, fans of LEGO and fans of art. I think it would be a fun day of building. Sounds stupid but have to ask while I can: Do you ever use glue to hold the sculptures together? If not, then what? 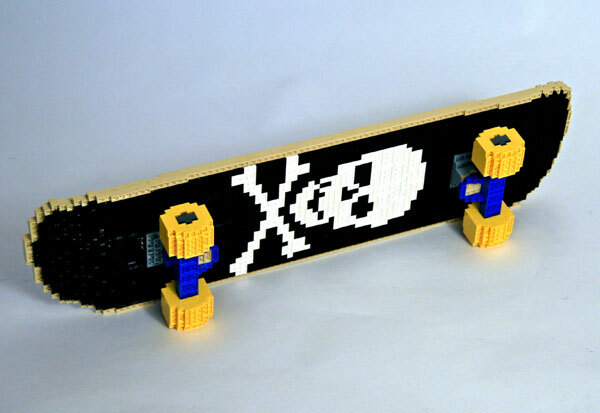 There are some kids out there that build Lego sets and do not play with them but rather just admire them. They refuse to glue them but then get upset when a piece (s) falls off and they are unsure about how to put it back together. Yes, I glue my sculptures together so that they can be shipped to all parts of the world. The LEGO bricks snap together just fine on my sculptures, but the glue is important to ensure the sculptures arrive safely. But with this small Yellow kit, glue would definitely not be necessary. 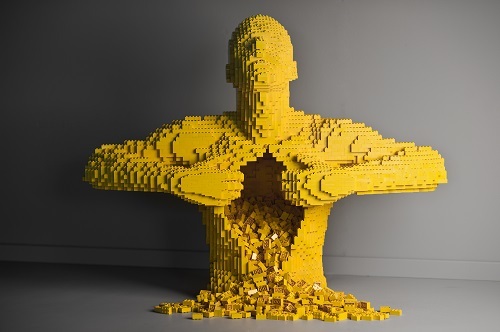 NOW.... THAT I have shown you all these amazing images... you must do me, yourself, and future makers out there a great gift of kindness and vote for "Small Yellow"
Want to buy Nathan Sawaya's book on Amazon right now? Use my link to support Toys are Tools. I thought this was amazing and certainly inspiring. What wonderful artwork. I love it. I'm not sure if i've seen his before or not. 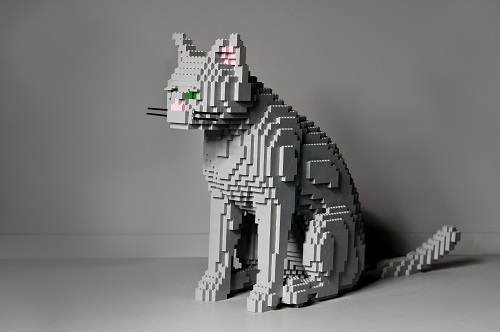 I've looked at so many amazing lego sculptures. 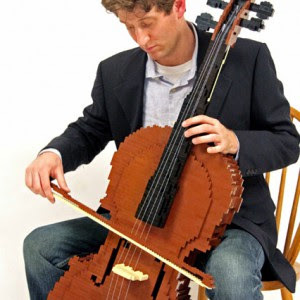 I have seen this before but didn't realize it was made with Legos. So cool! The kids were blown away but made it known to me we don't have enough of a color to create something similar. Possibly an inspiration to them? Hope to vote soon.... just catching up on e-mails. Never heard of Cuussoo. Really great site and creations. Seen his work before. Amazing.